A workman is worthy of his hire and an employee expects to receive remuneration. A worker earns the salary he is paid and a craftsman has a right to receive his pay. A man in receipt of his wages is given what he has earned and has what he deserves. In the same manner, sin has its own particular price and the wages of sin is death. The just and fair deserts of sin is death – and death is the loathsome reward for sin. 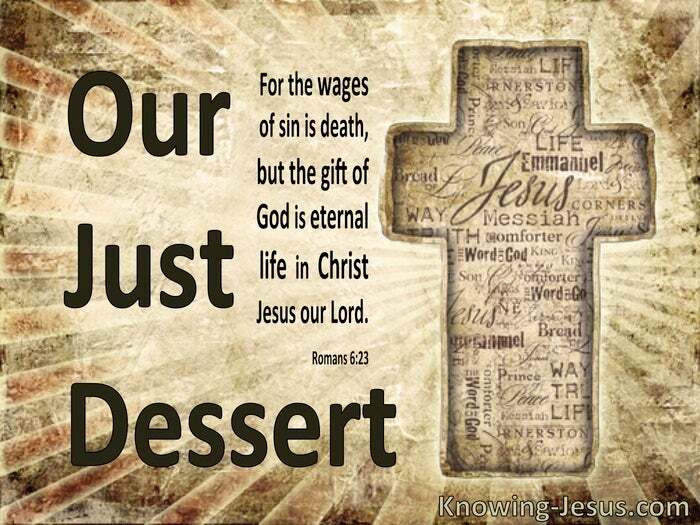 The just deserts of the sinner are not a negotiated salary but are ordained of God. No sinner will be unfairly treated, but all will receive the only fair reward for sin.. and the wages of sin for every sinner is death.. and death is non-negotiable. There are many faces of sin and different kinds of sin but every sin deserves death. There are open sins committed in the body and veiled sins that mature in the mind. There are hidden sins and visible ones, for man’s very nature is streaked with evil – and the just decree of a holy God is death – for death is the reward for sin. The terrible master of man is sin and man is the slave and servant of sin. This profound reality is a devastating truth that touches every strand of humanity – and every man deserves his due reward and each must be paid their just desert. The pleasure of sin maybe sweet for a moment but its bitter taste is never-ending. The seeds of evil are vanity and the buds of iniquity bear the bitter fruit of sin, for the wages of sin is death…. 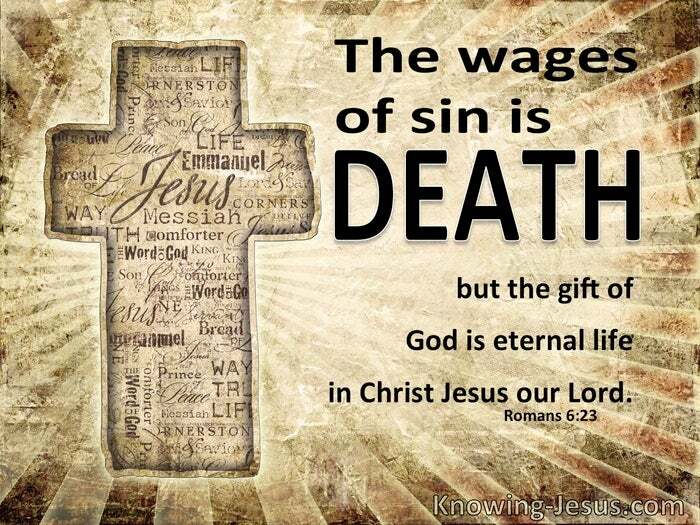 BUT the gift of God is eternal life in Christ Jesus our Lord. The price for all sin was paid for in full by the blood of the sinless Lamb of God. The sins of the world were paid for by the blood that flowed from Christ’s veins – mystery of mystery that God’s own Son should die for me – and die for you. And from His unblemished sacrifice.. streams out God’s grace to a fallen race of man. And from His justifying righteousness issues forth regeneration for those who believe. And Christ received the wages for my sins and yours so we could be forever forgiven. And He paid the price in full so that we could receive the gift of eternal life instead. The gift of God is salvation through Christ and eternal life is a beautiful consequence. Salvation is offered to all and given to those that believe on the Son of God: for all have sinned and the wages for all is death – but God sent His Son so that all who believe in His work on Calvary would be saved. The wages of sin is our due, but salvation is God’s gift to all who believe – and it comes singularly through the redeeming blood of Christ. Mystery of mystery that God’s own Son should die for me – and for you.